This post was originally published Aug. 18, 2017 and has been updated. The SMU and Dallas communities are invited to a lecture by Matthew Desmond, the Pulitzer Prize-winning author of Evicted: Poverty and Profit in the American City. The SMU Reads event takes place at 6 p.m. Thursday, Aug. 24, in McFarlin Auditorium. Desmond, a sociologist and MacArthur “Genius Grant” recipient, went into the poorest neighborhoods of Milwaukee to learn the stories of families struggling to keep even a substandard roof over their heads. The incoming Class of 2021 will discuss the book with faculty and staff members as their Common Reading on Sunday, Aug. 20, before Opening Convocation. Desmond is principal investigator of the Milwaukee Area Renters Study, an original survey of tenants in Milwaukee’s low-income private housing sector. Currently a professor of sociology at Princeton University, he previously served as Harvard University’s John L. Loeb Associate Professor of the Social Sciences and co-director of the Justice and Poverty Project. His work has been supported by the Ford, Russell Sage, and National Science Foundations, and his writing has appeared in The New York Times and Chicago Tribune. He has written on educational inequality, dangerous work, political ideology, race and social theory, and the inner-city housing market. Recently, he has published on the prevalence and consequences of eviction and the low-income rental market, network-based survival strategies among the urban poor, and the consequences of new crime control policies on inner-city women; his writings have appeared in the American Journal of Sociology, American Sociological Review, Social Forces, and Demography. Desmond is the author of three other books: On the Fireline: Living and Dying with Wildland Firefighters (2007), Race in America (with Mustafa Emirbayer, 2015), and The Racial Order (with Mustafa Emirbayer, 2015). He also is editor of the inaugural issue of RSF: The Russell Sage Foundation Journal of the Social Sciences, Volumes 1 & 2: Severe Deprivation in America (2015). After receiving his Ph.D. in 2010 from the University of Wisconsin-Madison, Desmond joined the Harvard Society of Fellows as a Junior Fellow. His primary teaching and research interests include urban sociology, poverty, race and ethnicity, organizations and work, social theory, and ethnography. SMU Reads was created to encourage reading and support literacy in the Dallas community. Under the program, members of the community join in the University’s annual Common Reading, as chosen by the SMU selection committee. Campus and community participants are invited to take part in gatherings and events focused on the book, including a presentation by the author. Evicted is available at a number online retailers, including Barnes & Noble. It is also available at a 10-percent discount at the SMU Barnes & Noble Bookstore, 3000 Mockingbird Lane. Call 214-768-2435 for more information. The presentation is free and open to the public. For more information, visit the SMU Reads homepage: smu.edu/smureads. [fusion_builder_container hundred_percent=”no” equal_height_columns=”no” menu_anchor=”” hide_on_mobile=”small-visibility,medium-visibility,large-visibility” class=”” id=”” background_color=”” background_image=”” background_position=”center center” background_repeat=”no-repeat” fade=”no” background_parallax=”none” parallax_speed=”0.3″ video_mp4=”” video_webm=”” video_ogv=”” video_url=”” video_aspect_ratio=”16:9″ video_loop=”yes” video_mute=”yes” overlay_color=”” video_preview_image=”” border_size=”” border_color=”” border_style=”solid” padding_top=”” padding_bottom=”” padding_left=”” padding_right=””][fusion_builder_row][fusion_builder_column type=”1_1″ layout=”1_1″ background_position=”left top” background_color=”” border_size=”” border_color=”” border_style=”solid” border_position=”all” spacing=”yes” background_image=”” background_repeat=”no-repeat” padding=”” margin_top=”0px” margin_bottom=”0px” class=”” id=”” animation_type=”” animation_speed=”0.3″ animation_direction=”left” hide_on_mobile=”small-visibility,medium-visibility,large-visibility” center_content=”no” last=”no” min_height=”” hover_type=”none” link=””][fusion_text] SMU welcomes new students to campus Aug. 16-20, 2017 with Mustang Corral, a five-day University orientation for first-year and transfer students. The Corral experience begins on Move-in Day, Wednesday, Aug. 16, and ends with the close of Opening Convocation on Sunday, Aug. 20. • Wednesday, Aug. 16: Move-in Day for First-Year Students, 9 a.m. to 4 p.m.
As new students arrive for their prescheduled check-in time, volunteers help unload cars and roll students’ belongings to their rooms. After move-in, families are invited to enjoy barbecues at Arnold Dining Commons, Umphrey Lee Dining Commons and the Mack Ballroom in Umphrey Lee. Students board buses and take off to #DiscoverDallas through SMU’s popular morning field trips. Students choose one of 22 different tours to learn about their new hometown, with destinations ranging from the Dallas Zoo to the Perot Museum of Nature and Science to kayaking on White Rock Lake and touring AT&T Stadium. Students also can select community service sites, including the North Texas Food Bank, SPARK and Dan D. Rogers Elementary School. On Thursday afternoon, students head to Camp Corral for a two-day, one-night retreat just outside of Dallas. Incoming and upper-class students will have the opportunity to interact while learning about the SMU community. Highlights include the Club Corral dance and closing candlelight ceremony. The Class of 2021 gathers on the main quad Saturday morning for a class photo in the shape of a giant 2021. The day wraps up with Night at the Club at the Dedman Center for Lifetime Sports, an introduction to the hundreds of clubs, community service groups and campus activities for students. Sunday begins with University worship in the morning, and the SMU Reads discussions of SMU’s 2017 Common Reading, Evicted by Matthew Desmond, in the afternoon. Mustang Corral ends and the academic year begins Sunday evening at 5:30 p.m. with Rotunda Passage, a processional march through Dallas Hall’s Rotunda to Opening Convocation, the ceremonial gathering in McFarlin Auditorium where new first-year and transfer students are formally welcomed to SMU by faculty and administrators. SMU President R. Gerald Turner will present remarks. For more information about Mustang Corral, visit SMU’s New Student Orientation blog. In 2017, most poor renting families are spending more than half of their income on housing. Eviction, once a rare, last-resort scenario, has become an ordinary occurrence, especially for single mothers. Harvard sociologist and MacArthur “Genius Grant” recipient Matthew Desmond went into the poorest neighborhoods of Milwaukee to learn the stories of families struggling to keep even meager shelter. The Pulitzer Prize-winning book that resulted – Evicted: Poverty and Profit In the American City – is SMU’s 2017 Common Reading. Significantly, one of the families Desmond profiles includes a landlord and her husband, writes Peter K. Moore, SMU associate provost for curricular innovation and policy. “Discussing the great difficulties the poor face just to keep a roof over their heads, it would have been easy to demonize the landlords, but Desmond shows their struggles as well — providing real nuance and a window into the issue’s complexities. “Ideally, this work will reveal to our students how much some people struggle to stay afloat financially — introducing them to the fact that those living near the poverty line typically spend up to 50 percent and in some cases 90 percent of their income on a decent and safe place to live,” Moore added. “Written with the vividness of a novel, [Evicted] offers a dark mirror of middle-class America’s obsession with real estate, laying bare the workings of the low end of the market, where evictions have become just another part of an often lucrative business model,” wrote Jennifer Schuessler in The New York Times. The annual book discussion with faculty, staff members and new SMU students will take place on Sunday, Aug. 20, before Opening Convocation. In addition, Desmond will visit the University Thursday, August 24, for a 6 p.m. lecture in McFarlin Auditorium, with a Q&A session and book-signing afterward. This story is updated from a version that was published Aug. 17, 2016. Attorney and author Bryan Stevenson , whose intimate account of politics and error in the U.S. criminal justice system became SMU’s 2016 Common Reading, visits the Hilltop on Thursday, Oct. 13. The Common Reading Public Lecture begins at 4:30 p.m. in McFarlin Auditorium. The event is free and open to the public. Also on Thursday, at 8 p.m., Stevenson will deliver the Jones Day Lecture in SMU’s 2016-17 Tate Distinguished Lecture Series. Students who wish to attend the Tate Lecture can go to the basement of McFarlin Auditorium at 7 p.m. with their SMU IDs for possible free seating on a first-come, first-served basis. Stevenson was a young lawyer when he founded the Equal Justice Initiative, a legal practice dedicated to defending those most desperate and in need: the poor, the wrongly condemned, and women and children trapped in the farthest reaches of the criminal justice system. Author and attorney Bryan Stevenson will give a free lecture at SMU Thursday, Oct. 13, 2016. One of his first cases was that of Walter McMillian, a young man who was sentenced to die for a murder he insisted he didn’t commit. The case drew Stevenson into a tangle of conspiracy, political machinations, and legal brinksmanship — and transformed his understanding of mercy and justice. His telling of the McMillian case is captured in Just Mercy: A Story of Justice and Redemption. The story is “[e]very bit as moving as To Kill a Mockingbird, and in some ways more so … a searing indictment of American criminal justice and a stirring testament to the salvation that fighting for the vulnerable sometimes yields,” wrote David Cole of The New York Review of Books in his review. And Stevenson is “doing God’s work fighting for the poor, the oppressed, the voiceless, the vulnerable, the outcast, and those with no hope,” wrote legal writer and novelist John Grisham, author of A Time to Kill, The Client and The Innocent Man. SMU welcomed new students to the Hilltop in August with five days of learning, bonding and exploring their new home. Throughout the week, University reporters and photographers captured the Class of 2020 at Mustang Corral and in the Discover Dallas program. Now their photos, social media posts, and a new video by SMU News’ Myles Taylor are gathered at one link. 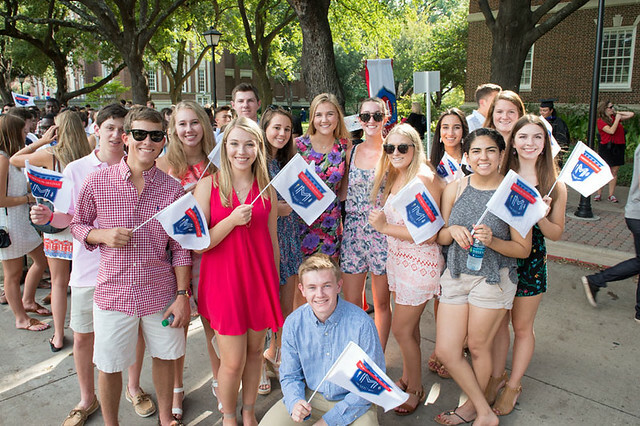 Visit SMU News for many more dispatches from Move-in Day, Camp Corral, the 2016 Opening Convocation, the making of the class photo and more. Visit the SMU calendar to keep an eye on upcoming events. Learn how to submit your own events at this link. Bryan Stevenson was a young lawyer when he founded the Equal Justice Initiative, a legal practice dedicated to defending those most desperate and in need: the poor, the wrongly condemned, and women and children trapped in the farthest reaches of the criminal justice system. One of his first cases was that of Walter McMillian, a young man who was sentenced to die for a murder he insisted he didn’t commit. The case drew Stevenson into a tangle of conspiracy, political machinations, and legal brinksmanship — and transformed his understanding of mercy and justice. “Presumptions of guilt, poverty, racial bias, and a host of other social, structural, and political dynamics have created a system that is defined by error, a system in which thousands of innocent people now suffer in prison,” Stevenson writes. His telling of the McMillian case is captured in Just Mercy: A Story of Justice and Redemption, and his book will be discussed by faculty, staff members and new SMU students as the 2016 Common Reading on Sunday, Aug. 21, before Opening Convocation. Stevenson will visit the Hilltop on Thursday, Oct. 13, for a free and open Common Reading Public Lecture at 4:30 p.m. in McFarlin Auditorium. On the same night, at 8 p.m., he will deliver the Jones Day Lecture in SMU’s 2016-17 Tate Distinguished Lecture Series. Watch for more information in a future SMU Forum post and at the Common Reading website. Emily St. John Mandel, author of Station Eleven, the 2015 SMU Common Reading selection, will present a free lecture at 6 p.m. Wednesday, Sept. 9, at McFarlin Auditorium. The entire community is invited to attend. Station Eleven is set 20 years after a virus has killed almost all humanity. The main characters are a traveling troupe of actors and musicians who bring performances of Shakespeare to the small and struggling human settlements that remain. The novel tells the story of the global disaster in real time and of its survivors 20 years later. Community members, alumni, book lovers and book clubs are invited to join SMU Reads, a program that encourages reading and supports literacy in the Dallas community. SMU Reads participants can take part in other events planned by the University’s SMU Reads partner, the Dallas Public Library. By registering to take part in SMU Reads, you will receive regular e-mails informing you about special events and gatherings. In addition, you also will qualify to purchase Station Eleven at a 10 percent discount through the SMU Barnes & Noble bookstore. Upcoming events include survivalist training at REI, urban emergency preparedness from Dallas County health leaders at the J. Erik Jonsson Central Library and a pop-up performance of King Lear performed by Shakespeare Dallas. Partners in SMU Reads include Big D Reads, Dallas Institute of Humanities and Culture, Dallas Public Library, Dallas Social Venture Partners, Deep Vellum, Friends of the SMU Libraries, Highland Hotel, Highland Park Library, Highland Park Literary Festival, Richardson Public Library, Shakespeare Dallas, SMU Alumni Relations, the SMU Barnes and Noble Bookstore, University Park Public Library, Well Read Women of Dallas, and Wild Detectives. For more details about events and to preregister for Mandel’s lecture visit smu.edu/smureads. SMU’s incoming class of 2019 will read and discuss the first work of speculative fiction chosen for the University’s Common Reading program – Emily St. John Mandel’s acclaimed fourth novel, Station Eleven. Mandel’s book explores a post-apocalyptic America in which a deadly strain of influenza has wiped out 99 percent of the world’s population, mere days after A-list actor Arthur Leander has died of a heart attack during a performance of King Lear. Leander’s fellow cast members who survive the pandemic band together as the Traveling Symphony, bringing music and theatre to the small and struggling human settlements that remain. The novel tells the story both of the global disaster in real time and of its survivors 20 years later. Station Eleven is the third work of fiction chosen for the University’s Common Reading since the program began in 2004. The first, How to Be Good by Nick Hornby, was the Common Reading book in 2007; We Need New Names by NoViolet Bulaweyo ’07 was the 2014 selection. Past SMU Common Reading books also include Amusing Ourselves to Death: Public Discourse in the Age of Show Business by Neil Postman (2004), Nickel and Dimed: On (Not) Getting By in America by Barbara Ehrenreich (2005), The Spirit Catches You and You Fall Down by Anne Fadiman (2006), The Devil’s Highway by Luís Alberto Urrea (2008), Dreams From My Father by Barack Obama (2009), Zeitoun by Dave Eggers (2010), The Immortal Life of Henrietta Lacks by Rebecca Skloot (2011), The Big Short by Michael Lewis (2012), and The Other Wes Moore by Wes Moore (2013). The Common Reading Selection Committee is now seeking leaders for the pre-Convocation reading discussion on Sunday, Aug. 23. Discussion leaders will receive a free copy of the book. Active and emeritus professors from all SMU schools are invited to take part, as well as University staff members. In addition, St. John Mandel will give a public lecture for the entire community at 5:30 p.m. Wednesday, Sept. 9, in McFarlin Auditorium. To volunteer as a discussion leader, or for more information on this year’s selection, contact David Doyle. Acclaimed author NoViolet Bulawayo ’07 returns to the Hilltop to discuss We Need New Names – her award-winning first novel and the University’s 2014 Common Reading – with the Dallas community. Her talk will begin at 5 p.m. Monday, Sept. 15, 2014 in the Hughes-Trigg Student Center Theater. The lecture and Q&A are free and open to the public. Bulawayo, known to many at SMU by her given name of Elizabeth Tshele, earned her master’s degree in English from the University in 2007 after receiving her bachelor’s in English from Texas A&M University-Commerce. In 2010, she received her M.F.A. in creative writing from Cornell as a Truman Capote Fellow. She recently completed a 2012-14 Wallace Stegner Fellowship at Stanford. Her pen name is a tribute both to her mother, who died when she was 18 months old (NoViolet means “with Violet” in her native Ndebele), and to her childhood home, the second-largest city in Zimbabwe. We Need New Names tells the story of 10-year-old Darling, a Zimbabwean girl whose unexpected opportunity to live in the United States turns out very differently from her fantasies. The semi-autobiographical first novel has received several prestigious awards and recognitions, including the 2014 PEN/Hemingway Prize for Debut Fiction, the 2014 Los Angeles Times Book Prize for First Fiction, and the 2013 Etisalat Prize for Literature. We Need New Names is only the second work of fiction chosen for the University’s Common Reading since the program began in 2004. The first, How to Be Good by Nick Hornby, was SMU’s Common Reading selection in 2007. The novel is also the first Common Reading selection to be written by an SMU graduate.